The Preah Vihear temple. Photo by Heng Sinith. 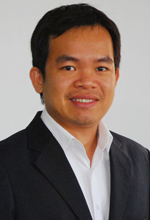 Dr. Eng Kok-Thay was born in 1980 in a remote village in Siem Reap province. After intense Khmer Rouge attacks, his family moved to Siem Reap provincial town in 1990 as internally displaced persons. Now as a deputy director of the Documentation Center of Cambodia (DC-Cam), he has worked for 7 years at DC-Cam and has been a supervisor of many projects including research, documentation, translation, digitalization, magazine, family tracing, book of memory and genocide education. Dr. Eng received his Ph.D. in Global Affairs at Rutgers University in 2012. He also received a Master of Arts in Peace and Conflict Studies at Coventry University, United Kingdoms, in 2004 and a Master of Science in Global Affairs in 2007 from Rutgers University under the Fulbright Scholarship. He contributes regularly to local Khmer and English language newspapers. Justice -- Knowledge generation is crucial to achieving justice and accountability in Cambodia. The Research Center will provide a state of the art facility to bring together international, regional and domestic researchers to explore the past and address themes important to Cambodia's future in a globalized world. 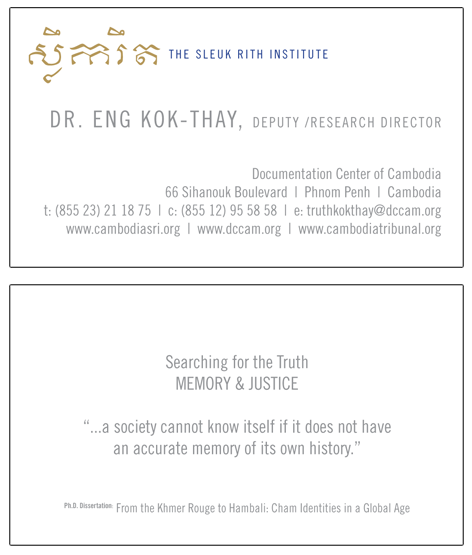 A Hub for Genocide Research – Documentation Center of Cambodia (DC-Cam) has been a critical resource for much of the leading work on the Khmer Rouge history since our inception, hosting up to 200 research visitors per year. Drawing on DC-Cam's vast primary material archive, scholars will conduct a wide variety of research projects, with an eye towards impacting policy at the national level. In 2007, the International Association of Genocide Scholars recognized DC-Cam for excellence, noting that we are the only center of our kind in Asia and encouraging us to expand our research agenda. We aim to be the leading research center on genocide, human rights and sustainable development in Asia, promoting accountability and cooperation throughout the ASEAN region. A Media Center – Only by disseminating the truth widely can we help Cambodians heal and move towards a brighter future. We plan for our media center to become the source of a wide range of educational materials for the public. We intend to publish our existing monthly magazines, scholarly books, films and an expanded repertoire of academic monographs and works for the public. The Institute will also introduce two important new publications. The Cambodian Law and Policy Journal (www.cambodialpj.org) will promote critical legal scholarship on urgent legal, social, and development issues facing Cambodia and the Southeast Asia region. The Preah Vihear Times will be a major new, bi-weekly English newspaper that is geared to ASEAN audiences and deals with issues of justice and human rights.